"As seen in Jo-Ann Fabric and Craft Stores® Fall/Winter 2012 FASHIONfusion Magazine. 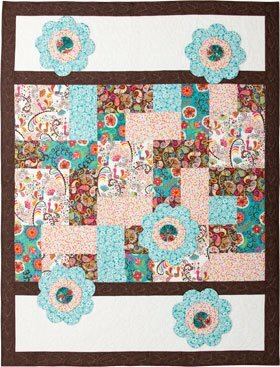 The whimsical patchwork grid and three-dimensional flowers featured add instant joy – and a bright pop of color – to any space. Use EZ Quilting® tools to make cutting faster, easier and more accurate." Free Resources: The Simplicity Creative Group has assembled a wealth of free resources, take a look! Do you like this design by Mimi?